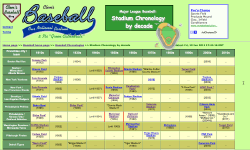 General chronology (annual): new stadiums, franchises, All-Star Games, World Series, etc. Stadium chronology (annual): Year-by-year compendium of construction, renovations, etc. (at end) 16 16* 16 16 16 16 24 26 26 30 30 30? Number of franchise relocations 2 0 0 0 0 5 3 2 0 0 1 0? Number of MLB cities (at end) 10 10 10 10 10 15 20 22 22 26 26 26? NOTE: Numbers in the table above exclude temporary stadiums, i.e., those used for four years or less.